Sounds simple and to the point...However, when I RIGHT CLICK my ActiveX Container, and go to INSERT ACTIVEX OBJECT, under CREATE CONTROL, I have no "Adobe PDF Reader" option. I am sure if I had "Adobe PDF Reader" control it would be simple to display a PDF file in the front panel. Where can I download the "Adobe PDF Reader" control? I am running Windows XP, with Adobe Acrobat 7.0, and Labview 8.2. Do you have Adobe Reader installed as an application on the PC? I have Adobe Reader installed on mine and it shows up in the "insert ActiveX object" list as Adobe PDF Reader. I think the only way it wouldn't show up is if Reader wasn't installed. I would suggest reinstalling Acrobat and making sure that you are installing all the options. Also, search the list because the name of the control might be different. Another point is that you can use an Internet Explorer control and that usually knows how to open most common types. P.S. I would say dump Acrobat and use Foxit instead, but it does not seem to have an ActiveX control. Free Code Capture Tool! Version 2.1.3 with comments, web-upload, back-save and snippets! LabVIEW, programming like it should be! Thanks for all the great responses! 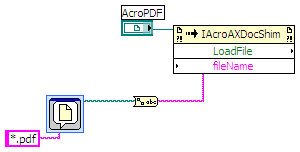 I installed Adobe Reader 8.1, and after I installed Reader, the ActiveX option appeared in Labview. I had Acrobat installed, and I guess having Acrobat installed doesn't come with the ActiveX plugin. The only other note I would make is your VI PROPERITES --> EXECUTION -->PREFERRED EXECUTION SYSTEM must be set to USER INTERFACE. Again thanks for the help!